Alternating hard and soft items just makes a room feel better. Chances are, if an area is bugging you, you probably have too many hard items such as furniture, next to each other. Breaking them up with an upholstered piece, a plant or something soft will help immensely. For some reason groupings of odd numbers work well together If a grouping or vignette isn’t working well, try it with an odd number of items with varying heights and shapes. Less is almost always better than more. Too many items in a room get lost and create chaos rather than interest. Clear everything out and only add in what you love. Angled items in a room create interest and gently guide you around the room. Try an angled piece in a corner or an angled accessory or two on a shelf. 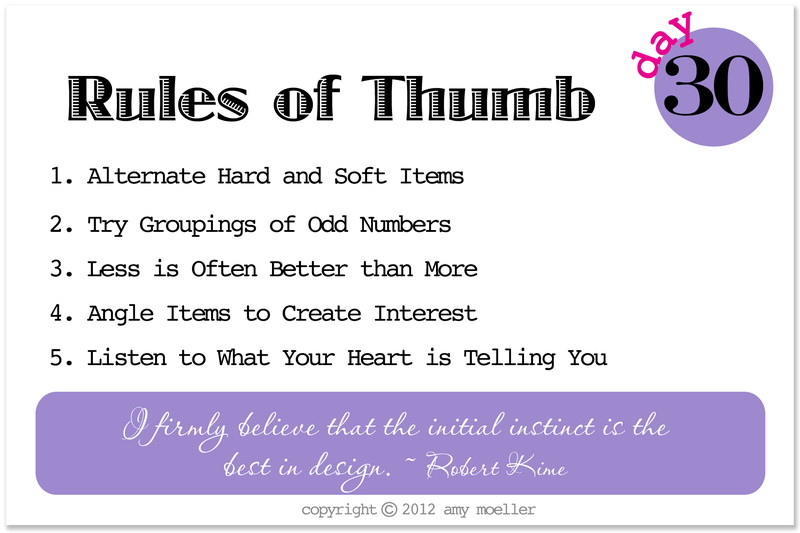 Assignment: Apply these Rules of Thumb to a room in your home that just doesn’t feel right and when decorating your new space make sure to reference these along the way! Click here to begin at the beginning of the series! Use what you have. Use the principles you have learned to rearrange your furniture. Look at each room and see what may look better or could serve a better purpose in another area. De-clutter. Add a new wall color and for under $100 your space will feel fresh and new! Explore DIY options for painting furniture you own or find at a thrift shop. Try no-sew draperies, adding trim to lamps or inexpensive drapes. The ideas are endless. It’s amazing what you can do to freshen up a room with very little money. Shop at discount stores such as TJ Maxx, Homegoods, Ross, Marshalls and more. When shopping department stores clip coupons and keep your eye out for sales. Decorate in Layers and do what you can when you can. Beautiful rooms are not created overnight. Wait till you can afford the picture you want… make do with what you have until you can add your dream furniture. As long as you have a plan, it will end up beautiful! 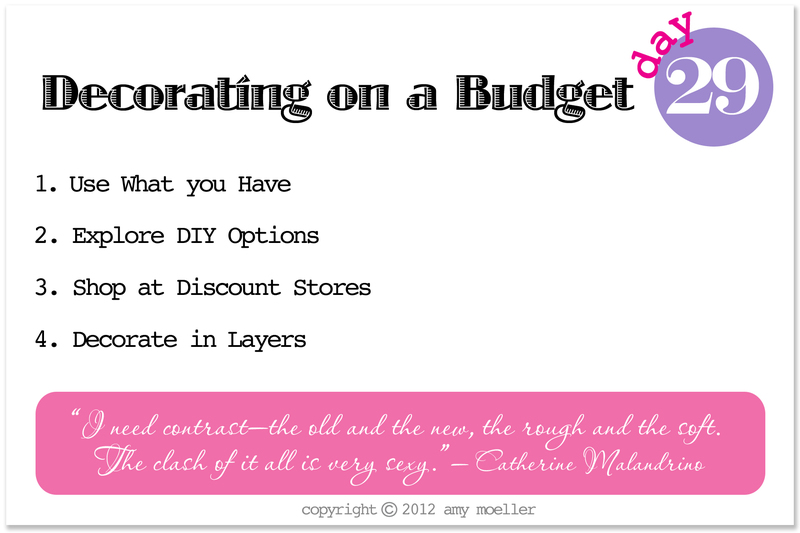 Establish a budget and track expenses as you go. Here’s a link to a free budget form that will automatically calculate your expenses and tell you what you have left to spend. Assignment: Try to avoid paying full price, without compromising the look you are trying to achieve. I have a bottle of probiotics in my refrigerator that I bought for my son a while back. Over the years he has had countless throat infections and I know all the antibiotics he has taken have probably destroyed the good bacteria along with the bad. Probiotics are helpful because they restore the good bacteria that antibiotics destroy. I’ve been wondering if maybe I should take it, because I’ve read that it also can help with digestive problems and constipation. The latter being a problem I’ve been battling lately – even smooth move isn’t helping. Yes, we’re talking about “that” again. Sorry. Kombucha is a cultured tea that is loaded with enzymes, probiotics and antioxidants. I first tried it over at my friend Lisa’s house. Lisa of PickMeYard – guru of everything natural and interesting, had made a pot of it from scratch and gave me a sample to taste. It’s definitely an acquired taste with a strong fermented flavor, but it’s supposed to be incredibly good for you. Of course, as with anything natural, there are debates about it as you can read in this article. Lisa said to drink the Kombucha with a straw, as it can be tough on your teeth. She also told me to check out Rejuvelac, saying it’s easier to make on your own, better for you than Kombucha, safer and works better as a laxative. Here’s some information about Rejuvelac. I just might have to try making that soon! Last night we stopped at Whole Foods and we split a bottle of Organic Raw Kombucha. 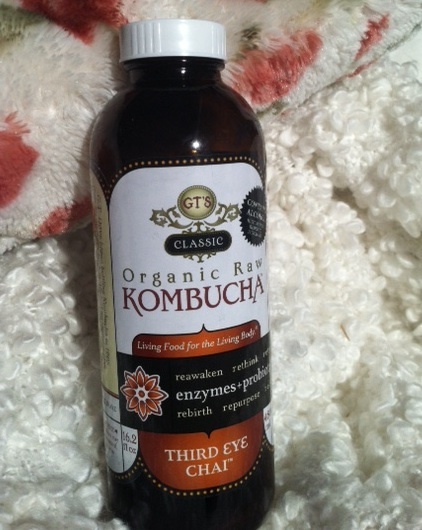 We tried the GT’s Classic Organic Raw Third Eye Chai. It was actually very good. Within hours I was a fan! Translation: If you’re constipated, try it! There are debates as to whether probiotics are effective when juicing, but I say it’s worth a try! Include: Inspiration photos for the project, your floor plan, shopping lists, paint colors, etc. Store items such as business cards, samples, receipts and more. Keep an ongoing list of what you need, what you already have and tasks that need to be done. Check it off as you go. Lists keep you from becoming overwhelmed by a project. 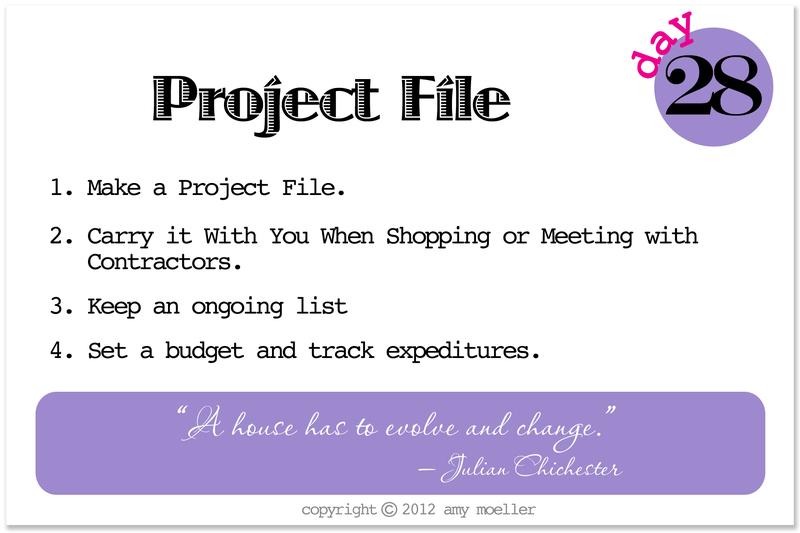 Assignment: Put together a project file for you space. 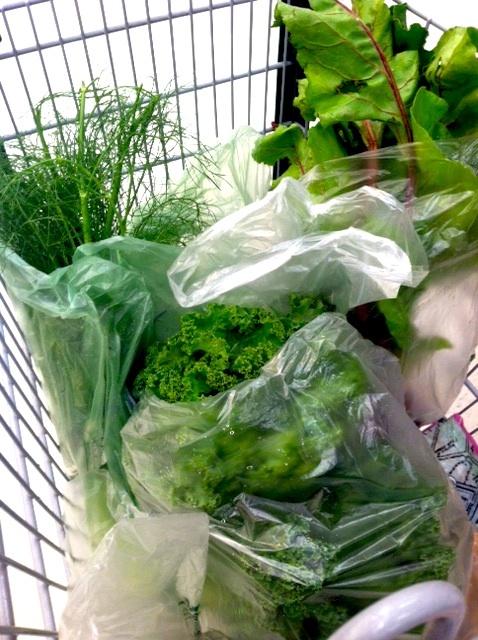 Make sure to carry it with you and keep it in the car for unexpected quick stops at the store. Use your floor plan to show sales people your room and pull out your paint chips as a resource when selecting items to ensure that they will match. Want to start at the beginning of the series? Click here! Yesterday was a travel day. I’m in Florida on business to work with Gigi, my friend and business partner. I love coming down here for lots of reasons, but mostly today because I have a juicing partner. I need that. I’ve been really struggling this last week to stay on track and there’s no better way to do that then to have a support system via a juicing buddy. Even if you don’t have the luxury of having one up close and personal, you can get lots of juicing friends by visiting Joe Cross’s Join the Reboot forums. There you’ll find tips and people like you who are interested in juicing. Some are struggling, others are just beginning and some have been successful in their quest to get healthy. I highly recommend searching out a support system. Like anything else you do in life, it’s nice to have someone along for the ride who understands you and is cheering you on! 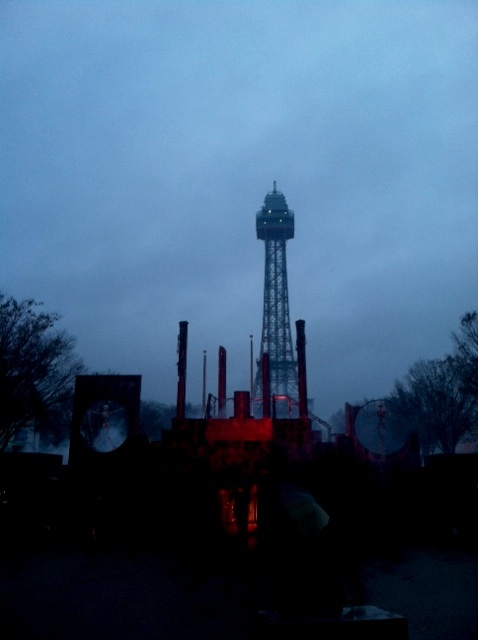 I’ve discovered that the best way to stay on track is to keep busy, so this past friday on a wet, cold, blustery night, I went to Kings Island – a local amusement park, for a haunted evening of frights and amusements. Some would say it was crazy. Okay, most would say it was crazy, but I stayed on track, rode some crazy rides, waited in zero lines and had a blast. Saturday I helped my son clean his house so he could get ready to paint and renovate. I am sore from head to toe, but we got lots done and I stayed on track. Do you see the trend? Keeping busy = Staying on track. To start at the beginning, click here! Make sure to mix it up by adding items such as sculptures, small lamps, decorative plates and more. Stack books horizontally or vertical. Old books are especially fun without their paper covers. 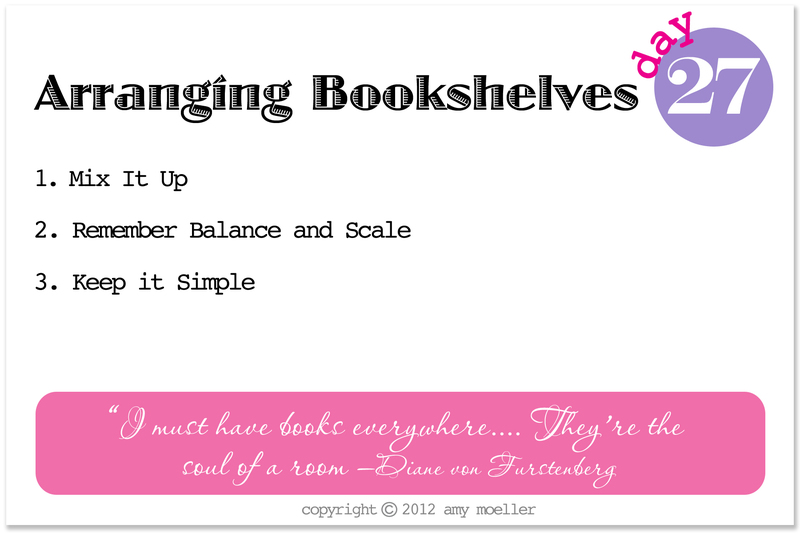 As always, remember balance and scale – make sure there are vignettes within the bookshelves, but that neither of them are more important than the other. Avoid a cluttered look by keeping groupings simple. Too many items will confuse the eye and create chaos rather than interest. Assignment: Find a book shelf in your home and remove everything on it. Then start adding items back in. Look for things around you home that you can use and only use things that you love or that have meaning!